Hold the reed in your mouth to dampen it. This allows the mouthpiece to resonate freely. Insert the reed into the mouthpiece. To do this, loosen the clamp screws and place the flat side of the reed flush with the tip of the mouthpiece. Once secure, tighten the screws and re-attach the mouthpiece to the saxophone. Position your hands on the saxophone. Place your right thumb in the thumb-rest, your palms on the palm keys, and your fingers spread out across the keys on the front of the instrument. Roll your lower lip over the top of your lower teeth. Rest the reed on your lower lip. Your teeth and upper lip should then rest on top of the mouthpiece to create a seal. Touch the tip of the mouthpiece with your tongue. Stand in an upright position and relax your shoulders. Breathe deeply from your diaphragm as you blow into the mouthpiece. Remove your tongue to allow air through. Press the keys to create different notes and alter your breathing to alter the pitch. Your left hand should concentrate on the keys that play B, A and G, with your right hand covering the keys for F, E and D. The octave key is above the thumb rest on the back of the saxophone, and pressing this will make the notes you play an octave higher. Clean your soprano saxophone after every use. To clean your mouthpiece, use a lint-free cloth and rubbing alcohol, and rinse with cold water. The mouthpiece should be left to air-dry. 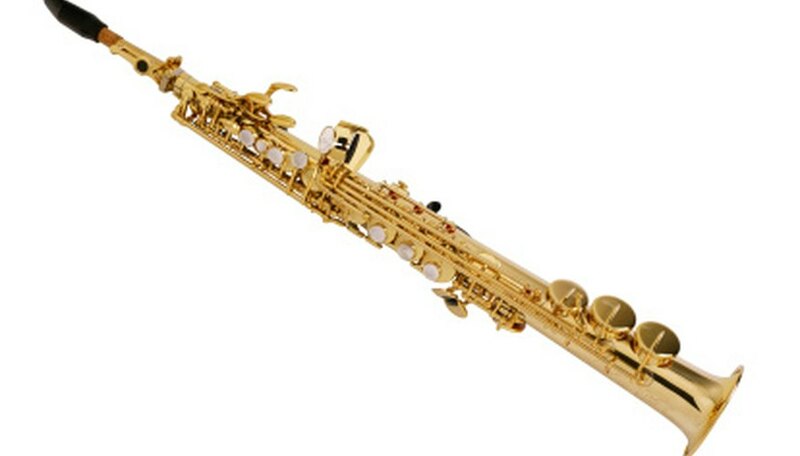 You'll need to purchase a special instrument cleaner to clean the inside of the saxophone. Marc Wright has been writing professionally since 2004. He has been published in the literary magazine "Things," as well as the student newspaper "The Demon" as a music critic. In 2009 Wright graduated from De Montfort University of Leicester with a Bachelor of Arts in creative writing and English.